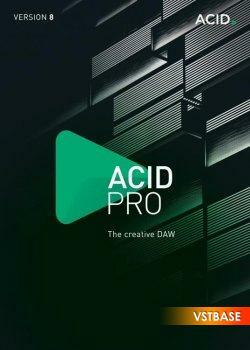 ACID Pro 8 is the creative DAW for all music producers. Behind its slick new interface lies a powerful, 64-bit music production powerhouse. It combines ACID's famous easy workflow with pro-level features, over $1000 worth of new instruments and effects, and 9 GB of all-new ACIDized loops. ACID has a world-class, 20-year heritage and, with VST3 support coming soon in a free update, ACID Pro 8 is very much the creative DAW for today's forward-thinking artists. ACID Pro 8 is a powerful 64-bit DAW that has ACID's famous innovative audio looping, powerful multitrack recording and hi-end audio and MIDI features, all set within an easy-to-use interface to help artists of all levels create their dreams. With a brand new GUI, but the same, famous ACID ease of use, this is an immensely creative music production environment. ACID Pro 8 also adds 64-bit processing, no less than 16 new instruments, 15 new effect plug-ins, 9 GB of new ACIDized loops, and there's VST3 support coming soon in a free update giving you access to thousands of third party plug-ins. Take advantage of all the power of your 64-bit operating system for creating complex projects with tons of loops, demanding plug-ins and lots of tracks and real-time effects. Power for your music. Refreshed User Interface Inspired to inspire! The completely refreshed user interface is designed for the special needs of musicians. Precise mixing, creative composing or professional recording – all at lightning speed. An incredible suite of 15 instruments including the DN-e1 analogue synth and Vita Sampler. 15 stunning effects: from the Analogue Modelling Suite to Vandal guitar effects, plus an amazing 9 GB of new ACIDized content and free VST3 support coming soon! With a 20-year heritage, ACID defined and created innovative loop-based music creation. ACID Pro 8 refines the concept while adding even more creative tools, instruments and effects. It's a 64-bit powerhouse of a DAW ready for a new generation of creative artists and musicians. It's time to experience a DAW with unparalleled MIDI sequencing and loop-based music creation features. It's a DAW with more instruments and effects than ever before, the same easy workflow that ACID has always been famous for, superb remixing features and free VST3 support just around the corner. It is the DAW with which you can create your musical dreams.